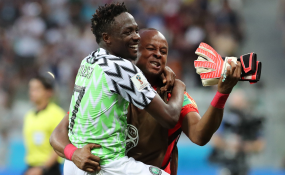 Scorer Ahmed Musa and goalkeeper Ikechukwu Ezenwa celebrate Nigeria's 2-0 win over Iceland at a World Cup game in Volgograd. Ahead of the African Cup of Nations (AFCON) qualifying match between Nigerian Super Eagles and Bafana Bafana football club of South Africa, Delta State Governor, Senator Dr Ifeanyi Okowa has promised to give the Super Eagles $25, 000 for every goal scored. Governor Okowa gave the assurance yesterday while interacting with members of the Super Eagles after watching them train at the Stephen Keshi Stadium, Asaba. According to the governor who watched the training with some members of the state executive council, "we are truly excited as a state to have you train at the Stephen Keshi Stadium, we are glad that you are in Asaba and from what we can see, this is a team for today and the future." "The fact that you are leaving Asaba for South Africa; we are sure you will get victory; you are doing very well and we welcome you to Asaba; as a state government, we will contribute to what you are going to do out there in South Africa, for every goal, we are going to give you $25, 000," the governor said. He continued, "when you are back we are also going to host you here in Asaba, we want you to stay strong and success will be yours, because, we are a praying state and we are confident that you are going to South Africa to get a lot of goals; continue to work hard, you are on a national assignment, a call to service and you will succeed." President, Nigeria Football Federation (NFF), Mr Pinnick Amaju had thanked the governor for making the Stephen Keshi Stadium available for the Super Eagles to train, describing the team as the "most disciplined, young and promising who are in the home of sports, Delta State. " While Super Eagles Coach, Mr Genot Rohr described the pitch as one of the best in the country, the Captain of the team, Ahmed Musa assured Governor Okowa that they would go to South Africa and qualify for AFCON.